Sculp and tighten your legs with this lean leg workout. No excuses – you need no equipment, not a lot of space, and it’s over and done in 8 minutes! Do as many reps as possible within 30 seconds without any rest. Start with a warm up. Stretch your leg muscles properly for several minutes. Stay straight with your chin parallel to the ground. Drive each knee as high as possible for several times, squeeze and secure it with both hands. Then drive your leg behind your heap kicking your ankle toward your glutes, secure them with one hand. Swing your leg towards your body this time secure it with both hands. Pull the leg up to the body as high as possible. First do all exercises with the right leg without any rest. Come to a lunge position with the right foot forward. Make a 90 degree angle. Work at your own pace for 30 seconds. Get down to a lunge position with the right foot forward for about a second. Step back with your left leg and step forward. Don’t go as far as your lunge position. Hold each position for about a second. Take your time and work up to the advanced. Push and shrink the back leg up to your glutes. Come to a lunge position but not very deep with the right foot forward. Stand up and don’t raise your back toes off the map. Extend the hip and hold that position. Continue going up and down. Come to a lunge position as low as possible with the right foot forward. Jump your front leg side to side as far as possible. Slightly bend the knees bringing your right foot forward. Make a 90 degree angle. The lower, the more advanced it is. Jump your back leg side to side as far as possible. Work your own pace for 30 seconds. Get the body down with the right foot forward. Jump hold and switch the leg. Step up with both hands on the hips. Step back with a leg and continue in an alternating pattern. Change the leg and do the whole cycle again without any rest. Stand with the hands over the head. Drop down and keep the legs out. Jump and spin 100 degrees. Jump back and reverse direction. Drop down left leg, right leg. Bring legs back and turn down. Jump and spread your legs as wide as possible. Challenge yourself and reach up towards the sky. 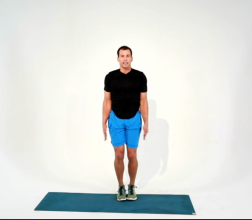 Do jumping jacks in a slow motion. You did it. No need to go to a cardio machine, no need to pick up the weights. You are done!